After writing my "Dwelling in a Tent" post a few weeks ago I remembered that I promised I would tell you the story about how Jon lived in a tent for a few month while we were engaged. It is a good one. Jon and I got engaged in August while we were both going to school at BYU in Provo, Utah. One of Jon's friends was moving to Arizona for a job in September. Jon decided that instead of renewing his contract at the place he had been living for the last few years that he would do his friend a service and take over the rest of his contract in September. That meant that he didn't have anywhere to live for a month. He'd always wanted to live in a tent for an extended period of time and he figured that, since he was getting married soon, that this would be his very last chance to live that dream. The only problem was that at BYU all students must live in BYU approved housing (mostly to ensure that unmarried men and women aren't living together in the same apartments). So Jon actually went to the housing office and filled out the application for a housing exemption. I would have loved to have been a fly on the wall when Jon explained to the housing director that he wanted to live in a tent up Rock Canyon. Surprisingly enough they gave him permission for his tent arrangements fairly easily. They just told him that he couldn't run a brothel out of it and other than that it would be fine. The best part of the story though happened about October. I had just auditioned for a modern dance group at BYU and the audition went horrible-- like I went the wrong direction and knocked over two other people horrible. I had to go to work right after the audition and I was so upset about it that I was on the verge of tears. I didn't think I could talk to anyone without crying and so when I got to work I went straight to my office without talking to anyone and put my head on my desk. I had a window in my office and I noticed that people kept walking by to look in at me and that they would whisper and then look with concerned faces in my direction. I tried not to notice and just focused on working and not breaking down in tears. Eventually one of my co-workers timidly stuck her head in and asked, "Heather are you okay?" "Was that your fiance?" she asked in a tender voice. "The guy who was attacked by a bear this morning up Rock Canyon? Was it your fiance? " I'd just talked to Jon minutes before on the phone and so I knew that it wasn't him, but I hadn't heard anything about there being bears up Rock Canyon! I quickly assured her that Jon was okay and a look of pure relief spread across her face. I guess that they had heard that morning about bear attack and they knew that Jon was living up there in his tent. The man who was attacked had a short three letter name and they couldn't remember how Jon spelled his name. Then when I came into work all flustered and upset they figured that it must have been him. Once we got things figured out it actually turned out to be fairly comical and made me forget all about my botched audition. Yet after the news of the bear attack (and run in with some teenage hooligans) Jon decided that he had had enough of living in a tent. Yet his friend, who was suppose to move in September ended up not moving until the end of October. It was starting to get cold and Jon was starting to be tired of being homeless. When our student ward bishop found out Jon was sleeping in his car in the parking lot he gave him an official church calling "to come sleep in my basement." Jon said he would never turn down a calling and so he slept at the bishop's house a few days, until his friend's apartment opened up. Asher has been really interested in whales lately and I have been trying to put together a collection of pictures and videos about whales for him. I would really love to find a program where I could embed the pictures and videos and he could look at them by himself, without me having to worry about him clicking onto other questionable videos. Any ideas about what might work? So far the only idea I've had is making a PowerPoint presentation, but that is more work than I really want to invest into this. Help? I know Memorial Day was a few weeks ago, but I wanted to share this experience because it was so sweet. Jon and I decided (or more accurately were prompted) last minute to go find the graves of my maternal grandparents. I knew which cemetery they were buried in but hadn't been to their graves since my grandmother's funeral, almost 10 years ago. Jon and I went to the directory at the cemetery and found where they were buried, and where my maternal great-grandparents were buried as well. We went to go see the grave of my great-grandparents first, because it was closer. We washed the grave and put some flowers down and Jon asked me to tell a story about them. I realized that I knew absolutely nothing about either one of them. It made me sad and reminded me that I really need to learn about the lives and stories of my ancestors. I don't ever want my children to stand by a grave and not know where they come from or who they are. 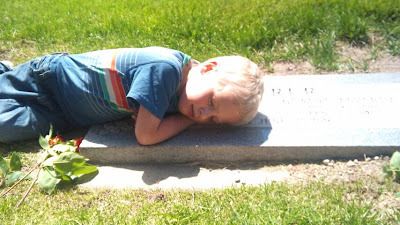 Asher was really tired by the time we got to the grave. At one point he stretched himself out on the tombstone and in a teasing voice, said " Look mom, I'm laying on your grandpa." Perhaps it was a little irreverent but it made us bust a gut laughing and I can't help but feel like my great-grandparents must have been laughing along with us. Later, when we went to my grandparents grave we ran into my uncle and his family, who I don't know very well. It was such a blessing because he was able to share stories about my grandparents and my great-grandparents that I'd never heard. We were able to reconnect and it felt so good. Now I have a bit of a fire in pants about doing my family history, I really want kids to know their ancestors! I would love to know how you teach your children (or how your parents taught you) about their family history? What has worked? The LDS Holistic Living Conference is less than a month a way! Are you going to be there? If not it still isn't too late to register! I am starting to get really excited about it. All "The Gift of Giving Life" authors are flying in to be there (we will have a booth where you can buy the book), it will be the first time that all of us have met together in person! Several of us have met individually or in small groups but because we live all over the country we've never all gotten together before. I can't wait. These women have become some of my closest friends, and it is just incredible that we have been able to write a book together. Some days the miracle of it all just overwhelms me-- God truly works in mysterious ways. Come hear me speak at the conference. It should be good. Though I have been having nightmares the last few weeks that I get up to teach and realize that I forgot to prepare anything, that no one shows up, and that I forget to wear a shirt. That would be bad, real bad but hopefully won't happen. Thank you to all of you who have been hanging in there with the Five Things for Friday posts when I have been so behind in life. I appreciate it! Have a wonderful weekend. Also, I messed up my link up link! Sorry about that. Maybe check out "Blue Planet," which is all about sea life, not just whales, but there are whales in there too. How fun that you get to meet all the authors! Thanks for sharing your miracles. My son is named after his great-great-great grandfather, Dominique. He was converted to the Church in Italy, and came over the plains as a pioneer. We moved to Italy for awhile and visited the little town where he was born. So that particular branch of the family, at least, is very real to my children. All of my boys are named after some relative so that's one way we keep family history alive around our house... we like to tell them who they were named after. Also, I try to tell them stories about my grandparents who have passed on. I wish I knew more ways to keep the stories alive! In regards to family history, just tell the stories. Stories are a wonderful way to learn and retain information. As you learn stories about your ancestors, share them with your children. If there are items that go with them show them the item or pictures of similar items. Show them pictures of the people you are talking about. All these things will make them more real to your children and to you. I agree with Paige...just tell stories! I was blessed to live in my grandmother's basement for a while and she let me read some family journals, and that was just wonderful! I found personality quirks that I carried, and it was fun to learn where I'd gotten them from, and so many funny little stories that I like to share now. One of my favorites was when my great grandfather was trying to court the girl who would become my great grandmother. She was reluctant to do much with him. He tried for weeks to get her to visit his house and finally had a brilliant idea. He knew she loved history and honored Pres. Lincoln, so he told her that at his house he had a copper engraving of Lincoln that he wanted to show her. She agreed, and after spending an hour or so there, asked him where the engraving was. He proceeded to pull a penny out of his pocket. She was furious at him for "deceiving" her, and slapped him. At the same time, though, she was flattered and liked his creativity. I loved his journal especially, and enjoying sharing stories of funny and of spiritual natures from his life. If you are anywhere near any of your grandmothers, I suggest you ask who has family journals and see if you can read them. Perhaps you can make copies or type them up for members of your family - that would be a valuable gift, which one of my grandmothers did for Christmas a few years ago. I love that binder full of history! I remember that story about the bear attack up Rock Canyon! So glad it wasn't Jon!!! I always loved hearing stories about my ancestors growing up. Because I lost my paternal grandparents when I was I baby, I always craved learning more about them. Because it was such a difficult thing for my dad to talk about I really cherished the times he would share stories about them. Now that I'm a mom, I try and tell the kids stories about their family often. They love to hear stories about Bryson & I when we were younger and when their grandparents were young parents. Also, each of our children's names have a special family connection, so that serves as a constant reminder of their forebearers. Wish I could be at the conference this year, Heather-- it sounds wonderful. I have no worries that you will be amazing and that you will remember to wear a shirt. :) Best wishes! I love Jon's homeless story, haha! As far as teaching the kids about their ancestors...I've felt inspired to include a Family History Spotlight in our FHE's. It will take some time to prep. But I'm trying to compile stories from our ancestors' lives - 1-2 pages per person (or just a few sentences if that's all we have about them), plus a picture if we have one. Then whoever is in charge of doing the Spotlight that week will flip through our Family History Spotlight binder and choose someone to highlight...Depending on the ages of the kids at the time and their attention spans in the moment, we may just share a couple sentences, a paragraph, or a whole page. If we do this every Monday, they'll get to know the stories of lots of ancestors pretty well by the time they're teenagers methinks. My plan will take a lot of prep time but I'm really excited about it and will LOVE to have such an amazing collection of stories and pictures in one binder. :) All the work will be worth it! I really want our kids to know about their amazing heritage. I think that if I commit myself to just researching one person per week and putting a page together for that person, that will help get me going. I don't have to have the entire binder completed before we start using the spotlights! I also want to make some kind of Family History board game or card game, but I haven't designed the mechanics yet. It would probably include some bits of trivia/stories, and pictures from various ancestors we learn about in the spotlights. I may even make a few different games....Guess Who?...charades where they act out the ancestor's story (once they already know them well) or maybe even something like Cranium...and a genuinely unique board/card game as well. Awesome idea to have a highlight binder-- that is brilliant and SO worth the effort. I think I will have to do this too-- I'd love to see how yours turns out. Will you share it? Also My husband's family has a guess who game for their extended family (not dead yet) and it is so much fun. It would be awesome to have one about ancestors. Thank you so much for the great ideas! I've thought of making pages for 1 ancestor per week until Christmas and then making copies of the pages and putting them in binders to give to each of our siblings and parents (for Christmas) so they can have and use them too if they wish. I'm sure my Grandmothers and some cousins would love copies too. Then as I make up more pages, I can email them so my family can add them into their binders themselves. I have done 2 pages for one ancestor so far...An ancestor whom we have TONS of (amazing) info on (part of his story is in the Ensign as he was an early convert, he helped build the Nauvoo temple, served in the Mormon Batallion, was at Sutter's Mill when gold was discovered, settled parts of Utah, I have copies of his patriarchal blessingS given him by Hyrum Smith, etc etc) It was SO hard to boil it down to 2 pages. I feel bad to leave out some of the amazing things I've learned about him because then my family wouldn't know ALL the cool stuff about him... One of the ideas behind the binder though is that we already have BOOKS about each of a few ancestors...and I honestly haven't read them yet. Too much info for one person and I just haven't sat down and done it. But if there are only 1-2 page summaries on people's lives, that is easier to digest for the everyday family member and not so intimidating. ;) And it can wet their palate to then go back and delve in deeper as they're so inspired. One challenge I am already finding is that I am picky and want each person's page to be "perfect" before I move onto the next one, so doing 1 a week may or may not be the best idea... Anyway... I stepped away from the project for a while, but mentioning it here makes me want to get into it again. :) When I make some significant progress on it, I'll share it with you! Another family history idea I just thought of and didn't mention before: During my last year or so at BYU I was in a cooking class and had to make a basic recipe book...From there I was inspired to contact family members and get as many family recipes as possible (trying to get some from older generations specifically before those recipes and stories are lost), with any stories or memories that went with them and pictures of the person whose recipe it was. That was a neat project too.